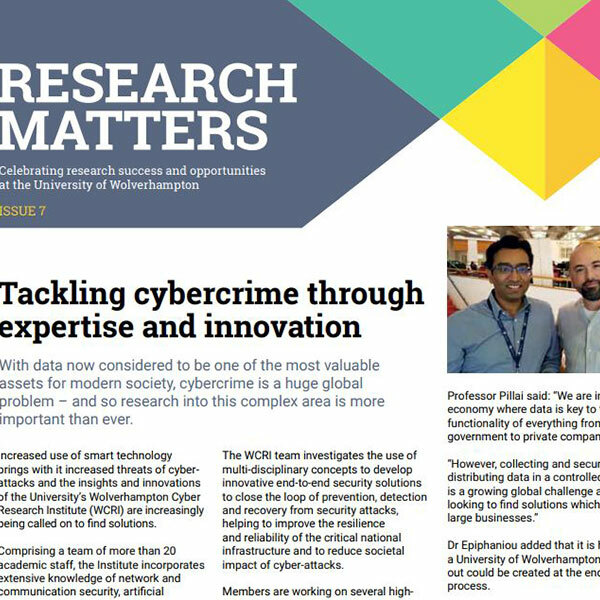 Edition 7 of Research Matters, the magazine that celebrates research success and opportunities at the University of Wolverhampton is now available to view online. Print copies will also be available in libraries and on reception at City, Walsall and Telford Campuses over the next few weeks. Professor Silke Machold, Dean of Research at the University, said: "The summer period was a busy one for many colleagues and at recent graduations, we also celebrated a number of internal promotions so our congratulations go out to colleagues. "In this issue we focus on a variety of research projects across all of our faculties including the expertise and innovation of the University's Wolverhampton Cyber Research Institute (WCRI) in the Faculty of Science and Engineering and the School of Humanities is exploring the smells of the Black Country."